How much does the jobless rate affect your job search? The Cincinnati Business Courier recently reported that the Ohio jobless (Why they don't just say unemployment?) rate fell in February. When I first started this blog back in 2002, I often wondered about the unemployment rate. It's really a bit of an inaccurate number, when you consider that it's the number of people filing for unemployment each week. It doesn't count those who are still unemployed yet have either stopped meeting the reporting requirements or have had their unemployment benefits expire. The rate describes a macroeconomic condition; i.e., a condition of unemployment as a whole. More importantly, I also found, at least for me, that I began using the unemployment rate as an excuse for not keeping up with my job search as intensely as I could have been. So the jobless rate is falling or rising... whatever. The statewide/national jobless rate shouldn't affect your own job search and career management. Stay focused on your own job search. Companies still have positions to be filled. Your industry (also known as "vertical" by some) may have high demand for labor. Don't use the rate as an excuse. Am I off base here? Does any of this make sense? What do you think? Inc.com produced a slide show listing 7 Easy Ways to Get Fired. Using Top Business Lists for market research and lead generation? When I was looking for my first job out of college, and in many of my subsequent job searches, I've often looked at the top business lists for the area where I was looking. 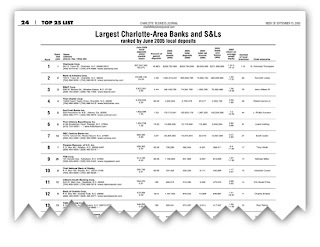 The print editions of the Cincinnati Business Courier and Dayton Business Journal, for example, contain top 25 lists of various companies and individuals in various categories. It looks like these lists can be ordered online, too: here's the link for Cincinnati Business Lists. From this link you can search other markets and categories, too. As a job seeker, I've personally preferred to spend some time at my public library, searching their archived lists, instead of spending money on these lists. Have you found these lists to be helpful? Any success in getting jobs through Craigslist? Have any of you reading this blog had any experience using Craigslist to get a job? I know that the posts show an email address with which you can reply, but it's a Craigslist email address. Usually company names are omitted in these postings. I did see that you can subscribe to an RSS feed of search results in Google Reader or some other feed reader, which is pretty cool. How I Got My Job! Maybe you're currently out of work, underemployed, or are simply looking for some guidance on how you can improve your situation. Chances are you've struggled with losing hope. You may even be depressed. I know I have been. That is why one of my favorite topics/labels on this blog has been success stories. These stories have encouraged and inspired me to have a fresh outlook and have even given hope when it has been lost. Throughout 2008 I am aggressively looking for more success stories to share with others. To that end, I'm launching a new project entitled "How I Got My Job", in which I record 15-20 minute phone interviews where my guests share how they got one of their jobs and release them to the internet as a podcast. Think of it as Inside the Actor's Studio, but for job searching instead of acting. Here's the basic premise: If you are currently employed or have ever been employed, you have been successful in getting a job. Just as there are certain common threads to each job hunting success story, there are bound to be some unique aspects as well. I look forward to capturing both kinds. I will most probably record the calls via one of the live conferencing tools that are available and will give out the phone number and other information prior to the set time and date of the interviews. Because the guest will share about one job only, each episode will last about 20 minutes. If it looks like this idea creates an audience, I may look at doing a live show where I take calls. Let's cross that bridge when we come to it, as they say. I hope that these interviews will encourage and inspire those who may have lost hope or need a fresh outlook. Maybe something heard during one of these interviews will help someone else in their own search. I (and many others) look forward to hearing from you. Not much time to blog right now, but I do want to make sure you read Jason's post aon Showing Compassion to a Job Seeker. I've got another announcement coming in the next week or so about a project I'll be doing that I hope will further enhance this blog's usefulness. Enter what kind of job you're looking for and where you're looking. Mouseover the results and the map will show its location. Click on a job listing for more information on the job and how to apply and email the job listing to yourself if you want. Note that the locations are approximate. For example, if the job location says "San Francisco", then the pin in the map will point to the center of San Francisco - it's actual location might be elsewhere. If you enjoyed this post, please consider leaving a comment or subscribe to the feed and get future articles delivered to your feed reader. Too many techies come across as arrogant in interviews, says Sean Chou, CTO of Fieldglass, a software technology company. "A lot of techies are very talented, but what comes out is arrogance," he says. Confidence is desirable, not arrogance. Arrogance suggests "they can't be a team player," Chou notes. What ways can you show confidence without it coming across as arrogance? matthewebel Not breaking into a cold sweat when some director asks you to make a pass at iJustine. mindofandre I always like to attribute my knowledge due to the fact that others have helped me learn. You haven't come this far without others. TheSatch I think a key for me is being willing to point to and discuss my own flaws, sometimes seriously and sometimes with humor. CollinDouma Best way to show confidence over arrgnc. Listen first, ask 3 questions for each of theirs + Hold your cool when "they" are proved wrong. jasonalba research the word "assertive" ... that might have what you are looking for. very powerful. tonysteward 1. Never offer criticism without a prepared solution 2. Arrogance makes someone unreasonable - be reasonable. 3. Confidence doesn't need everyone to agree - arrogance demands it or villianizes. RichBecker Relevant stories play better than laundry lists. What do you think? What are some ways to show confidence, or as Jason Alba put it, assertiveness, without it being perceived as arrogance?